I started by choosing papers from the Fairy Belle collection, distressing the edges with scissors and Black Sooth ink (Ranger). I used a crackle stamp (Prima) with jet black ink (Stazon) on the gray paper. I applied some pink chalk (Prima) on the last paper, then Platinum crackle paste (Prima) over a damsk stencil (Prima). When the paste was dried, I rub some silver gelato (faber-Castell) over the paste. 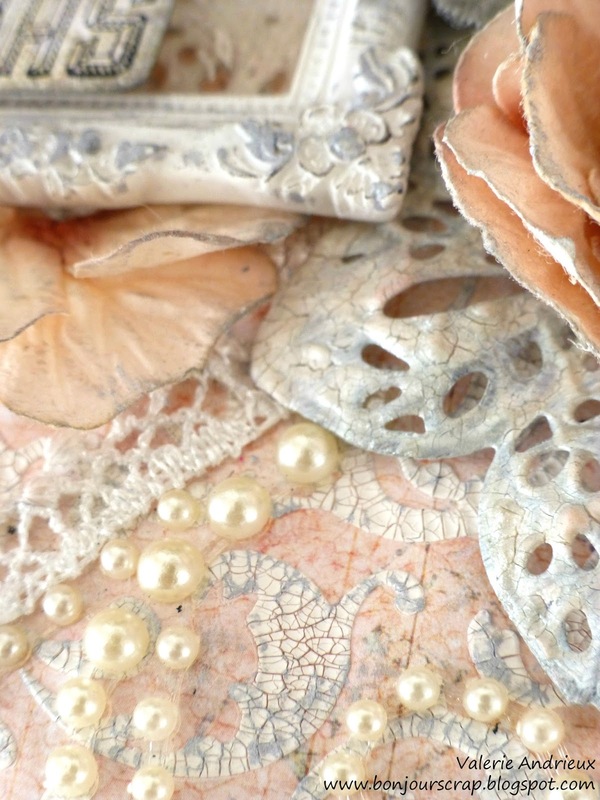 The metal embellishments were gessoed, then cover with Platinum crackle paste, and silver gelato too. I just add some pink chalk over it. The resin frame (Prima) has gelato on it, it makes the design pop up. Flowers are from different collection by Prima. I assembled the pink one from 4 hydrangeas. The gray poinsettia is cut out from one Fairy Belle paper and decorate with platinum paste over a crackle stencil (Prima Marketing). 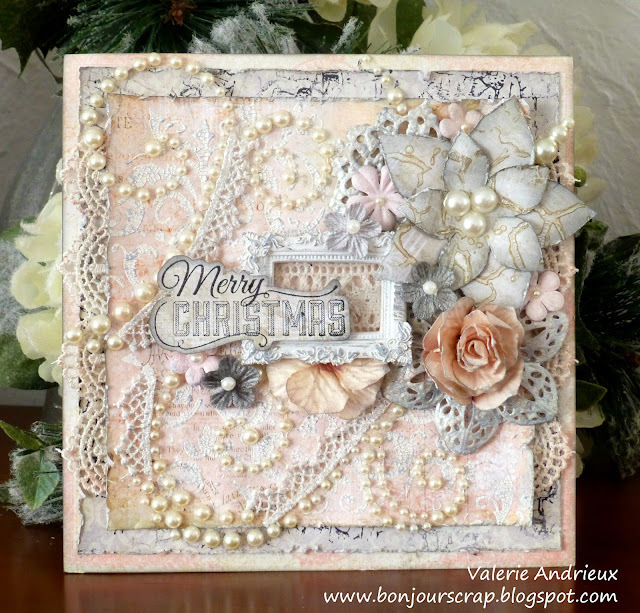 Some lace distressed with black ink and pink chalk, Say-it-with-Pearl swirls (Prima) and my card was done ! I almost forgot the sentiment ! It's a stamp from the Julie Nutting Merry Nice stamp set. 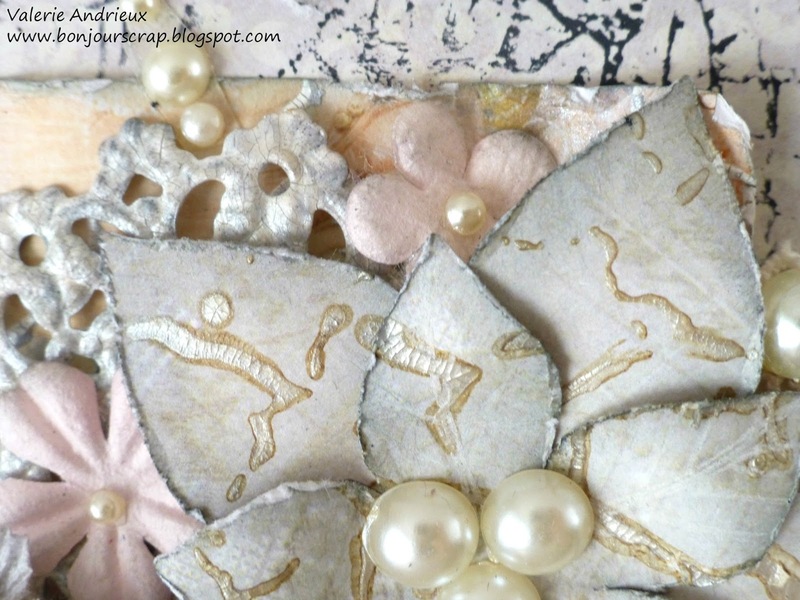 So, this shabby project make my 15th Christmas card !Waoh ! We are half way ! You have 15 days left to comment on any of my Christmas 2016 cards to enter my giveaway. Don't forget to follow my blog to validate these entries ! Thank you for stopping by and reading my blog. See you tomorrow for another card ! What a beautiful creation !! Thank you for your kind comment AND for following my blog, Doris !